Newsflash : Stacia actually gives a damn. Not long ago, I noticed that the amount of books I'd given 1 star ratings to had eclipsed the amount of books I'd given 5 star ratings to. There was something about this shift which bothered me. Had I truly become so jaded by reading that I'd somehow completely forgotten how to fall in love with books? Today, I realized that this isn't the case. It's nice to be reminded that I can fall hard for a book after having a long, dry spell. The feels were all over me. I couldn't wash them off if I tried, and I don't think I'm ready to let go of them yet anyway. "Wouldn't it be funny if we're the ones that start the whole lock thing?" "I like that," she says. I don't have the heart to tell her that in 2010, all the locks will be removed. Or that, in 2011, they'll start reappearing. They can cut our lock off. We'll just come back here together - in 1998 and 2008 and 2018 - and replace it every time it gets removed. 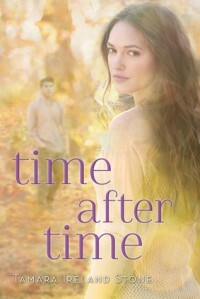 There's no way to review this book in-depth without spoiling, but if you were a fan of Time Between Us, you'll find more of that goodness in Time After Time. I wasn't sure if the author would be able to pull of a sequel which could live up to the first book, but this was truly the icing on the cake. If you haven't read Time Between Us yet, do yourself a favor and get on this right away if you're a fan of sweet love stories without annoying characters. Contemporary romance (whether YA, NA, or adult) has suffered the past few years from heroes and heroines who are parodies of real people. I felt Bennett and Anna's story the way I would feel a story as if I were living through it myself. There are no TSTL females or over-confident jerky males up in this mix. I sat back and watched two normal people living an extraordinary life. ...and I got teary eyed while doing it. "I don't get to hold on to any of it. I can't stay here. This isn't my home. And every time I have to go back, it kills me. Every. Single. Time. And it always will." To whom it may concern in the movie industry : Time Between Us needs to be a movie, please. I don't care if this subject has been done before plenty of times. I'm willing to forget I ever watched any other, similar movies for the sake of this story. This book provided from the publisher in exchange for an honest review. Quotes provided from the pre-published copy and may be altered or omitted from the final copy.